Location: Situated on hillside E of College Street, backing onto Church Street. 1911-15 Anglican parish church by W D Jenkins of Llandeilo, the tower completed as War Memorial 1924-6 by Charles Mercer of Swansea. Large scale in rock-raced coursed squared Forest of Dean stone with Bath stone dressings and some purple stone. Westmorland slate roofs. Free Perpendicular Gothic with NW tower, nave and aisles, chancel and chancel transepts. 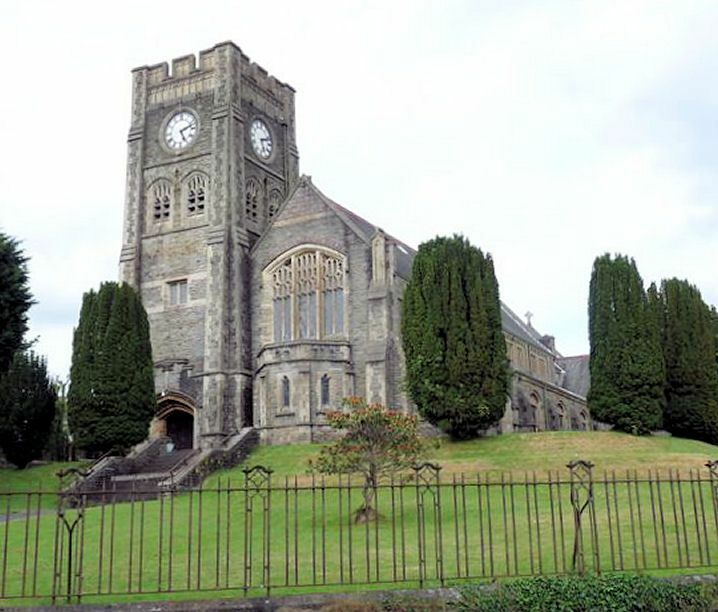 [Church is near identical to Gorseinon Church by the same architect 1911-13.] Windows have generally segmental-pointed heads, hoodmoulds and purple stone relieving arches. Gables are coped and shouldered with some cross finials, and chequered stonework to E and W end. Big 6-light W window over 3-sided baptistery with parapet. 5-bay nave with paired 2-light clerestorey windows in sunk panels, lean-to aisles with buttresses and 3-light windows, S aisle has door in left bay, N aisle abuts tower. S door has hoodmould with finial extended upwards into curved stepped parapet. Tower is of four stages, the original design probably did not include a clock- stage between the belfry and parapet. W door deeply recessed with heavily moulded head and hoodmould with finial as on S door. Big clasping buttresses, stepped once and the vertical faces battered. Plain 2-light windows to second stage, ornate paired Perpendicular style 2-light bell-lights above, then big circular clock faces and finally ornate panelled battlements. Chancel has transept each side with 4-light end window, the N transept actually a vestry with smaller gable projecting E. Big 7-light E window, divided 2-3-2, buttresses beneath, clasping corner buttresses terminated in ashlar gabled panels. Churchyard is surrounded by iron railings between stone piers, erected 1924. Tall 5 bay nave, rendered with Bath stone octagonal piers, pointed two-chamfer arches and hoodmoulds with carved stops. Tall chancel arch with similar chamfers and hoodmould, carried on corbelled wall shaft, with Art Nouveau carved head corbels. Fine hammerbeam trusses on corbels to nave roof, segmental- pointed boarded and panelled chancel roof, complex scissor-rafter roof to S transept. Fittings designed by Jenkins and made by Haughton of Worcester include Perpendicular style timber pulpit on stone base, chancel desks and stalls, octagonal stone font. Gothic reredos in timber of 1936, eagle lectern of 1914. There is a total immersion font under the nave floor. Included as a powerfully designed example of a full-scale late Gothic Revival church on a prominent site. Situated on the corner of Margaret Street. Situated some 50m from The Square. Situated opposite the S end of Talbot Road. Prominently sited at angle of Quay Street and Wind Street in the centre of the town.